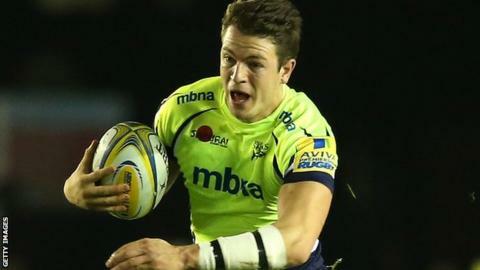 Sale Sharks centre Sam James aims to continue taking his opportunities after his run in the first-team this season. The 21-year-old scored his first try with a clever chip-and-chase against Northampton and followed that with a dancing effort against Harlequins the week after. The ex-England Under-19 international made his debut in April 2013, but made just four outings before this campaign. "It's good to get my chance and grab it with both hands," he told BBC Sport. "Sale give a lot of opportunities for young boys, so taking those opportunities is a step forward ." In their matchday 23 against Harlequins, Sale had eight players that came through their youth system - Ross Harrison, Tommy Taylor, Josh Beaumont, Sam James, Mike Haley, James Flynn, Magnus Lund and James Mitchell. The former Manchester Rugby Club player was a fly-half growing up, but now hopes to cement a position in the Sharks midfield. "Anywhere in the centre, I don't mind either inside or outside," he said. "I'm kind of leaning away from fly-half now as there is too much responsibility for me. "I'm getting plenty of advice off Jonny [Leota] and Sammy [Tuitupou] who are great role models for me, I couldn't ask for anything better. "Every day you're reminded boys pushing through like last year with Mike Haley - he was in my year so to see him go through to the first-team motivates you more to push on as a player."